Looking for a direct fit catalytic converter or universal muffler? Look no further than Walker exhaust systems. They have been in business since 1908 and today they are an OE (Original Equipment) supplier to many major automotive manufacturers. If you need to replace your catalytic converter, it is very likely that the original part was made by Walker. 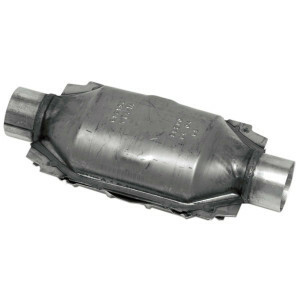 Walker produces mufflers and catalytic converters for a wide range of cars and trucks. If they don’t have a specific product to fit your vehicle they also offer universal components. While not a performance brand like Magnaflow or Flowmaster, Walker has been in the muffler business since 1932. It all started when they patented the louvered tube muffler – a major improvement over the standard mufflers available at the time. Fast forward 40 years later and Walker developed the first aftermarket catalytic converter while working closely with the EPA in 1978. Today, they continue to be the leader in direct fit replacement mufflers and catalytic converters. When shopping for replacement parts for your car or truck, I bet you want to find the best deal to get you back out on the road. Knowing that the price of replacement parts is important to their customers, Walker has many inexpensive exhaust products. To keep costs low, many of their mufflers and catalytic converters are made out of aluminized steel. While not as durable as stainless steel, it will still provide corrosion resistance for thousands of miles. That being said, Walker also offers mufflers that are constructed using stainless steel for increased durability. The Walker headquarters are in Lake Forest, Illinois and they have manufacturing facilities worldwide. You can find Walker plants in North America, South America, Europe, Asia and Australia. Although Walker sells inexpensive replacement parts, I have heard no complaints about the quality. If fact, this is one of the areas where Walker excels over the competition. Their customers constantly rave that they were happy to find a solution to their exhaust problems without spending a fortune. However, that’s not to say that every customer is satisfied. When manufacturing replacement parts for thousands of vehicles it can be difficult to get it right everytime. Some customers have complained that their replacement muffler had hangers in the wrong spots, making it difficult to install. When shopping for a replacement muffler be sure to use a fitment guide to verify that the part you are buying is specifically designed to fit your vehicle. Also, customers have been frustrated that their catalytic converter did not come with any installation instructions. The emissions control system on newer vehicles is inherently complex and it can be hard to find helpful info about your vehicle online. If you have not installed a catalytic converter before, you should have it replaced by a local mechanic near you. Walker has been in the muffler business since 1938 and have figured out exactly what their customers want: high-quality replacement parts at low prices. If you are looking for a replacement muffler or catalytic converter, it is likely Walker has a product for you. The reason they can offer so many replacement parts is because they are the OE supplier for many of the major automotive brands today.